Oakdale (population 213) is located in southwestern Illinois about 45 miles southeast of East St. Louis. This places Oakdale in the south-central portion of Washington County. The Missouri Pacific Railroad angles through town and the railroad line it occupies was very influential in Oakdale's early growth. Oakdale has no "Illinois" or "U.S. Route" traveling through it. Three County Roadways, 10, 16, and 21, all meet in Oakdale. A branch of the Elk Horn Creek flows through the west side of town. "Oakdale High School came into being in 1922. During the first two years it was a two-year high school. Then in 1924 it became a three-year high school being fully recognized by the state. The school has not grown in number of pupils but in amount of equipment and training of the teachers. The equipment added in recent years consists of history maps, two steel cabinets, biology maps and supplies, geography maps, and general science experimental equipment. A complete new library has been added during the last five years. There has also been added a new built-in cabinet for athletic supplies. In the past year an American flag has been added to each room. We do know that currently Oakdale's Grade School (grades K - 8) is supported by the community and surrouding area. We also know that Oakdale Grade School graduates attend high school in Nashville, its neighbor to the northeast. The article states that Oakdale High School was extablished as a 2-year high school in 1922. It became a 3-year high school in 1924. 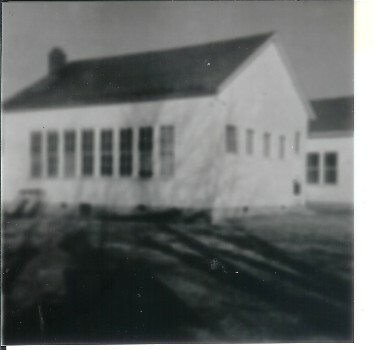 Oakdale High School served the community and surrounding farm families for 22 years until it was closed in 1944. School Fight Song: "Oakdale Loyalty"
There is no mention of any IHSA hardware won on the IHSA website (www.ihsa.org). We are not certain that Oakdale High competed in sports with other schools. "A wide range of sports were sponsored by our physical education instructor Mr. Woodrome. Softball was played in the fall and spring. While in the winter bowling and ping pong tournaments were played indoor. In addition to the above indoor sports mentioned, during physical education period badminton and rubber horseshoes were added means of exercise. At other times physical exercises filled part of the period, such as the hopping series, the toe topper, the wood chopper, and the knee bender. We have physical education four times a week." The boys basketball team played their early games in a room at the Ardrey Store in Oakdale for several years. "The first party of the year was held the first week of school in the high school auditorium. The freshmen class were properly initiated by the sophs and juniors. A few weeks later we all enjoyed a weiner roast in the Piper woods. Many running and singing games were played, until all were able to do justice to the soda pop and weiners. In November we all journeyed out to the home of Irene Fulton. Mrs. Fulton, assisted some of the students, served delicious refreshments. Mr. and Mrs. Stevenson entertained us with a Christmas Party held in their basement. The evening was spent in playing progressive games. Our Leap year and March Parties were held in the auditorium. The social committee entertained with plenty of games and good eats. Margaret Auld entertained the entire high school April 28th, at her home in the country. We spent an enjoyable evening and were served delicious refreshments by Mrs. Auld and Margaret."